We are saddened by the loss of mental health champion and former mayor of Oak Bay, Nils Jensen. Known by many as the heart of the community, Nils Jensen began as a councillor in Oak Bay in 1996, going on to serve two terms as mayor from 2011 to 2018. 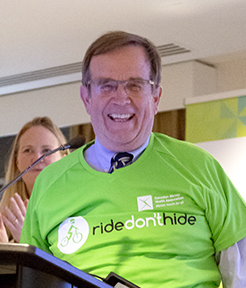 Nils was a dear friend to CMHA, participating in our Ride Don’t Hide community bike rides in Victoria for the past four years. In 2016, he joined our call for better mental health and addiction care in BC, endorsing the B4stage4 manifesto with his signature. We are thankful for his friendship and support for mental health in BC, and know his legacy will live on in the community. Our hearts go out to his family, friends and community for their loss.